One Size: 60 inches (152.5 cm) across the wingspan, 28 inches (71 cm) from nape of neck down. 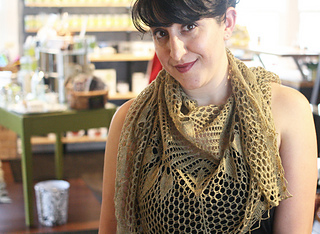 From the stockinette leaf motifs to the open honeycomb lace, this shawl delights in playing with positive and negative space. 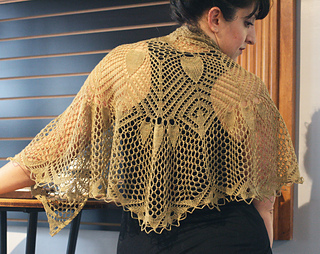 Taking a twist on an Elizabeth Zimmerman Pi Shawl, this half-circle shawl is drapey and elegant no matter how you wear it. 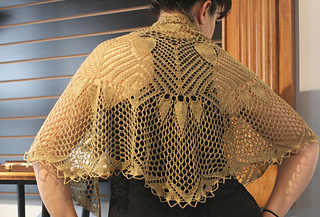 This shawl is worked from the nape of the neck beginning with a garter tab. Stitches are picked up from the side and cast-on edge of the garter tab, then the shawl is worked outward in 3 directions from there. The edge is completed using a crochet bind off that results in a stretchy & decorative edge. Yarn: 600 yards of lace weight yarn. Sample in Mrs Crosby Reticule (100% Superwash Merino, 840 yds/100g). Shown in “Boston Fern”. Gauge: 23 sts & 27 rows = 4 inches (10 cm) square in stockinette after blocking. Needles: 3.75mm (US5) 32-inch (80 cm) circular needle or size needed to obtain gauge. Notions: crochet hook near the mm size of the needles used, tapestry needle to weave in ends, and wires or string and pins for blocking. Size: 60 inches (152.5 cm) across the wingspan, 28 inches (71 cm) from nape of neck down. Techniques Used: knit, purl, slipped stitches with yarn in front. k2tog, p2tog, yarnover, double yarnover, ssk,sl1 k2tog psso, k3tog, p3tog, knit & purl into the same stitch, knitting and purling multiple stitches into a single yarnover, use of markers, crochet chains for bind off.